Welcome to my website! This is the best resource for information on my books, lectures and articles related to personal growth, mindfulness and teaching adults to embrace joy in their lives. I have dedicated my life to encouraging and inspiring others to bring forward their best in their relationships through a process of transforming thoughts and behavior and turning from reactivity to creativity and integrity. 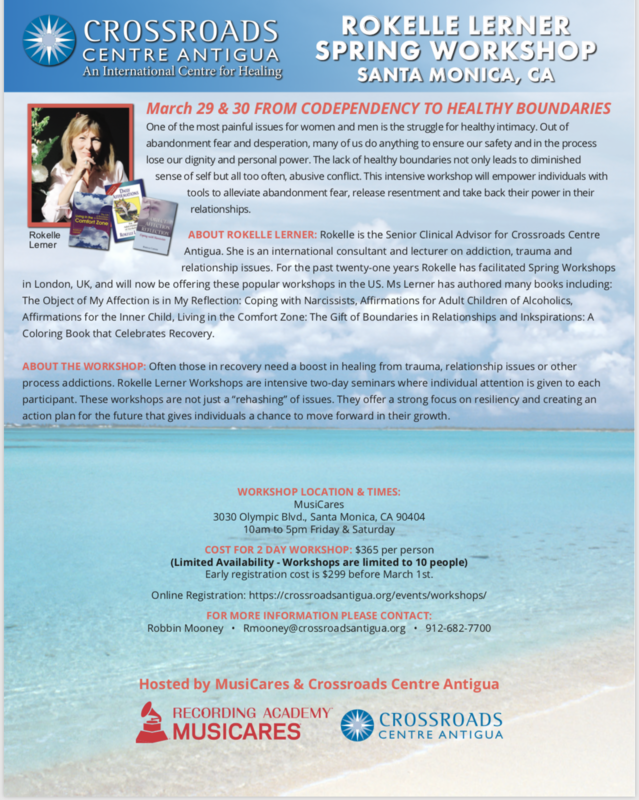 I am delighted to be the Senior Clinical Advisor for Crossroads Recovery Center in Antigua. Eric Clapton’s vision for an addiction treatment centre became reality in 1998. With experienced and internationally recognized professionals, Crossroads has grown to be the internationally recognized Treatment Centre of Excellence. I have a passion for facilitating group process and have trained therapists throughout the world on the nuances of group therapy. If you are interested in small-group transformational workshops in premiere locations world-wide that are designed to have guests learn to quiet the mind, improve relationships and tone their bodies in an exquisite environment. I will be blogging on this website and invite your questions, your requests and any comments you may have. The depth of knowledge and experience and Rokelle’s style of communication staggered me! She is a consummate teacher and therapist. Rokelle has the wonderful blend of wisdom, passion for her work and authenticity. Her ability to connect with her audience is second to none. She is just an incredible clinician! Rokelle is professional yet caring. She’s able to stay on task with a group and guide people with her wisdom. Rokelle Lerner is one of the most dynamic, inspirational, intuitive women I've ever met! Rokelle is an amazing clinician. She’s simply the most talented person I’ve ever worked with.